Some of the greatest athletes on the planet occupy space in the pool. Lap after lap they pull, push, and kick their way toward personal records. Unfortunately, the body doesn’t like repetition as much as they do. Although swimming is considered a low-impact sport, the repetitive arm movement can cause irritation in the shoulder joint and the surrounding muscles. Inflammation and stress of the tendons, ligaments, and muscles are common in the shoulder after repeated use. This condition is called Swimmer’s Shoulder. Swimmer’s Shoulder is a broad term used to describe shoulder injuries that occur from overuse. Since the shoulder is a ball-and-socket joint, there are various parts of the shoulder that can produce pain. A person may feel a localized pain near the shoulder that only hurts in one place, or they may feel a traveling pain that moves from the neck down into the arms. As the motion that initiated the injury continues, the pain may get worse in time or it will become more painful once the exercise has finished and the athlete’s body temperature has decreased. This is usually the case with injuries because an athlete typically doesn’t notice a minor injury until after they are finished training or competing. Here are a few facts on how injuries can occur to competitive swimmers as published in the Sports Health: A Multidisciplinary Approach in an article titled “Epidemiology of Injuries and Prevention Strategies in Competitive Swimmers” (Wanivenhaus, Fox, Chaudhury, Rodeo, journals.sagepub.com, 2012). While elite swimmers often swim up to nine miles per day during training, that distance requires more than 2,500 shoulder revolutions during one session. A study of NCAA swimmers found an injury rate of approximately 4 injuries per 1,000 hours of training in male swimmers and approximately 3 injuries per 1,000 hours in female swimmers. Shoulder pain is the most common injury among swimmers. Approximately 91% of competitive swimmers age 13 to 25 reported suffering from shoulder pain at least once during their training. Although shoulder pain is a difficult injury for swimmers to avoid, there are preventative measures that can be taken to help keep the shoulders functioning properly. Poor mechanics in the water can surely cause shoulder pain. At the same time, poor posture can also be a contributor to shoulder pain. Correcting posture is a constant task that everyone should give full attention. Long periods of sitting can lead to poor posture because a person’s shoulders begin to roll forward toward the chest while the upper back slouches forward. From slumping over your desk, to sitting on the couch, to staring at your smartphone for countless hours; everything we do can cause poor posture. The bad part is poor posture will inevitably cross over into the pool. Correct posture is attained when the ears line up over the shoulders and the shoulders are down, relaxed, and back. Having good posture is one of the best tools a swimmer can use to help prevent Swimmer’s Shoulder. Another way to help Swimmer’s Shoulder is through regular adjustments. Although there are several tissues that support the shoulder joint, a misaligned spine can cause the muscles and ligaments to pull differently, which can lead to muscle spasms, inflammation, and eventually shoulder pain. Chiropractic adjustments to the spine and shoulder can help the shoulder joint function properly by helping it remain in an even part of the body. 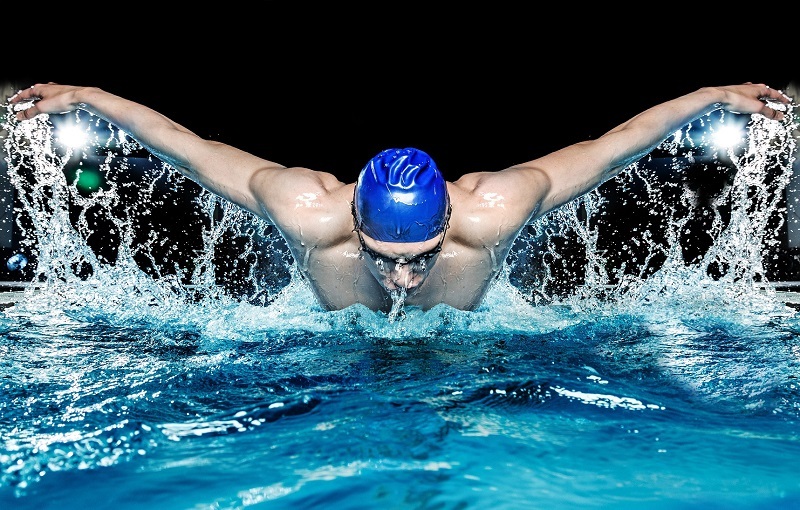 Most swimmers who receive chiropractic adjustments will find that their shoulders function better and are less susceptible to pain after long, hard workouts. Visiting the chiropractor for back pain or neck pain relief are the most common reasons to schedule an appointment. However, most people are not aware that a chiropractor is also trained to adjust other joints in the body, including the shoulders. Whether a shoulder injury is caused by joint irritation or tissue damage, they are often also related to spinal injuries. For more information on how chiropractic care can help improve pain from Swimmer’s Shoulder, contact your local chiropractor today. Don’t let Swimmer’s Shoulder interfere with your training.